Freelance translation is fast growing to be one of the best opportunities for people who wish to work from home. A combination of an economic downturn resulting in a difficulty in finding new jobs, near-universal access to the Internet, and the ever-increasing globalization of businesses and organizations, leads to a perfect storm of opportunity for those who speak more than one language. According to Commons Sense Advisory, a consulting firm, the translation, interpreting and localization industry has revenues of $37 billion per year, and it continues to grow. Translators can now earn a great living in ways that were unimaginable just 10-15 years ago. You can get paid to translate documents for the clients you choose, during the hours you choose, and wearing the clothes that you choose. 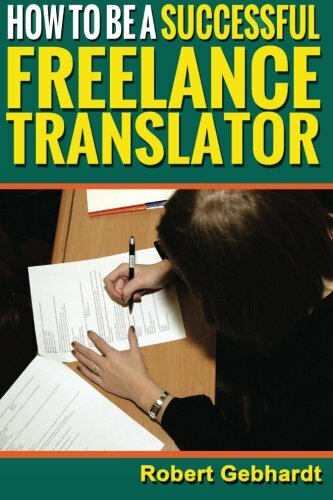 Unfortunately, many translators will miss this opportunity because freelance translation means an entire new process that no course or school teaches. Do you know where to find clients? How do you discern the useful clients from the wastes of time? How can you make sure they pick you as a translator? How will you get paid, and get paid in time? How can you avoid working for a pittance? You’ve learned your language, and this book concentrates on everything else. It walks you through the process of becoming a successful freelance translator, from preparation, to being chosen, to the translation process, to getting paid, and even to expansion – if you want to see how far you can take your translation business. HOW TO BE A SUCCESSFUL FREELANCE TRANSLATOR is 28,000 words long. Robert Gebhardt has been translating ever since high school, although he started making a job out of it in 2007. Since then he has lived in the US (Atlanta and Portland), Switzerland, Italy and is currently in Taiwan. Robert Gebhardt specializes in Italian-English and English-Italian translations.